Cold, my favourite subject. With so many ways to talk about it. Every year I note changes in my adaptation and responses. The fun in this, is that I can treat myself like a long-term experiment and see what happens, it makes the cold swimming even more interesting, adds more personal value to it. My main criteria is that for the last five years I’ve never been out of the sea longer than two weeks. The hypothesis therefore (and import of that) is that I never lose my hardening, the ability to swim in cold water. (It wouldn’t even be that long if I lived a bit closer to the sea). Last year I noticed a huge change in initial cold response to very cold water, where my cold shock largely disappeared with reduction in gasping and heart rate increase and pre-cold tension. So this year, as we are within weeks of the normal coldest sea temperatures of the year, what I’ve observed is how one of the best recognised symptoms of cold for cold waters swimmers, the Claw, is now longer appearing during the times I am currently swimming. I have extended my cold swimming times from last year and at forty plus minutes in six degrees Celsius, my fingers are still closed and my hand is under control. 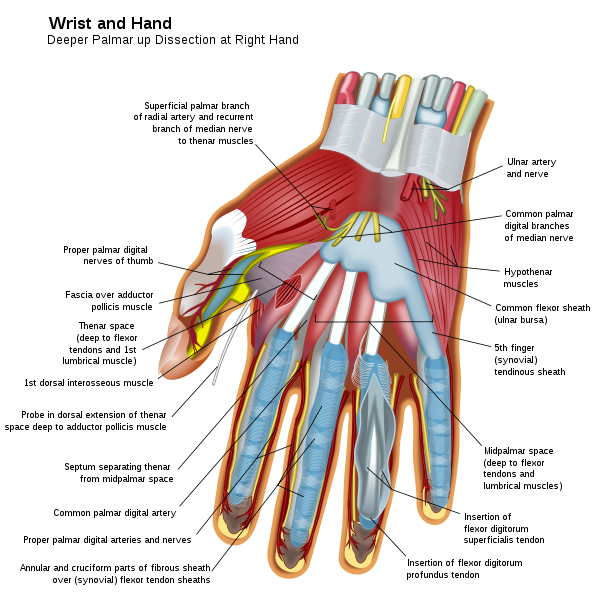 Above, we see again peripheral vaso-constriction in the hands, where there is no blood flow in the fingers. As often mentioned before, peripheral vaso-constriction is the body’s response to cold, where blood flow is concentrated in the core to retain essential body heat for survival. In more cold-adapted swimmers (and others) peripheral vaso-constriction seems to occur even more quickly. Therefore I have to admit, I don’t really understand why my hand isn’t Clawing recently. I’ve certainly been getting cold. So for now I just put it down to another adaptation and if anyone has any thoughts on this I’d love to hear them. It does help to understand also that there no muscles in the fingers. Yes, no muscles, your fingers are operated by muscles running through the Carpal Canal or Tunnel, which connect via tendons to the bones. It’s the flexion of the muscles in your wrist and forearm pulling on the tendons that moves the fingers, but there are no actual muscles in your fingers so the fingers get cold easily, as there is therefore less blood flow. I am NOT saying my Claw is gone altogether, just for these shorter, colder times. I have no doubt that longer swims in warmer waters, doing two hours in ten or eleven degrees will see the return of the Claw, as deep winter is not the problem for us, but spring, when temperatures are slightly elevated but swim times must be much longer. Edit: I should explain: As muscles get colder they contract. This is what pulls the tendons in the fingers apart. The swimmer’s ability to pull is compromised. It affects also the arms and legs so the whole stroke becomes shorter and less effective. I should also add, the extent of the Claw is determined by your ability to close or touch fingers. A mini Claw will leave you unable to close your small and ring fingers, a full Claw will mean you are unable to touch your thumb and small finger. Unless you have a lot of cold water experience and safety cover, you should not be swimming with full Claw. I breath bilaterally and so I think both hands get pretty much the same under and over water experience. 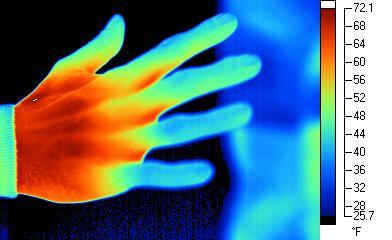 While my right hand is a pretty reliable thermometer, I never (touch wood) get claw hand in my left hand. Why? I’m just hoping that my left hand doesn’t get wind of what my right hand is up to ….getting biblical now…. Hey Rosin, how’s the training going? I don’t know, I notice a difference between both hands, I’m right-handed and my right hand goes first, I guess it must be something to do with the fact that motor control is greater in it, in the way that the hand/arm you use less usually feels stronger, but that’s only a guess. Apologies for the late reply. Talk about De Ja Vu look at the dates its 22-05-2016! Initially the cold water shocks your autonomic nervous system regulating blood flow to the surface because our skin is primarily responsible for maintaining temperature. This is part reason why the first three minutes is so uncomfortable, think space shuttle re-entry Houston we have a problem kind of stuff. Then as your body becomes colder it survives by redirecting the flow of blood to the central nervous system and vital organs. This reversal of flow is a natural non chemically induced vascular massage. Whilst the heart contracts automatically it still requires the nerve supply from the brain to provide an effective contraction for blood circulation. The nerves that supply the heart and left arm are from the same spinal segment. This is why the CLAW begins in the right arm, as the blood supply is needed on the other side to deliver oxygen to the cells that are maintaining the nerves that are controlling the heart that is keeping us alive and swimming. Aghhh – the lido is up at 10C again and “the Claw” has returned. Granted, I’m staying in longer than I was last year, but find it irritating I have to get out because my hands won’t behave. Others have noticed this too! Yep, now that the water is warming and we are staying in longer, I’ve also noticed that and Lisa mentioned it recently also. Return of the Claw, sounds like a Hammer Horror movie. Love the site. Came to it from Marathonswimmers.org. I’m looking at water temps in the low 50s (American, 10-11C) here in NY, and I’m contemplating a wetsuit. I have no desire to race in one, but I need to start upping the training for a 10 miler in early July. In the mean time, I haven’t bought a wet suit or jumped in the water (outside, I have been able to get a half hour in the pool 3 mornings a week through the winter). So, my longwinded question is, should I try to climatize while the water is at the coldest it will be? Or just get the wetsuit and start putting in some miles? Any advice is appreciated. @Kate, 5C is a warmer temperature? Are you using a wetsuit? Thanks for the compliments! I don’t use a wetsuit, I’m firmly of the opinion that what stops more people being able to swim in cold water is a lack of understanding of the process of adaptation and therefore a lack of desire. Unless NY is radically different than Ireland, which seems unlikely since they share an ocean, you’re actually already past the coldest point, usually around late February. have a look through the posts under the heading of cold, (there’s quite a lot), so it’s hard to synopsise everything, but I do consider 10C a critical point which is good for getting started on acclimatisation. (It hit 10 here this week, unheard of for this early, and the distance swimmers starting getting mileage in, I did 5k yesterday, some friends have done up to 12k. Expect it to be really tough at the start, but keep doing it. I spoke to a hand and forearm surgeon on a swim camp in Jersey and she said that it’s due to the nerve running through your elbow. Apparently it’s one of the closest to the skins surface (it’s the reason why hitting your ‘funny bone’ hurts/numbs so much). She told me that when the nerve gets cold it jams on and this causes the muscles to contract causing the claw. I think it now being there when it’s very cold is that we’re not in long enough to chill the nerve down as other things pack in first! Thanks Dan, that certainly also adds to the jigsaw. We’re all wishing you the best by the way, I’m sure you know. It’s funny that you should talk about this because it’s something that I’ve been thinking about lately too. While my hands have been getting cold and numb (I’m sure that Finbarr will attest to how much I complain about them! ), I haven’t been getting the claw. I noticed today during the longer swim (three laps) that I had little control of my baby fingers for a short time (maybe ten minutes during the second lap), but they were fine then again. My feet are a different story though…they get so sore and I think my toes tense up because I was getting slight cramps in my calves today while I was swimming. Hopefully that will go away too in time! I’ve asked a couple of regular swimmers at the lido about this. It seems that like me, they just can’t feel their hands at all at this temperature, however we do suffer at warmer temperatures (5 – 10C) for longer distances. Maybe it’s just part of the adaptation process as I’m not sure I suffer as the water warms up, but I’ve only been through one complete seasonal cycle so far. I guess Spring will be when I have the opportunity to find out. I think that’s it Kate. I used to get the Claw after 15 or 20 minutes in the coldest water, but I don’t anymore, it won’t be until I start doing an hour in the slightly warmer water of spring that the Claw will return again. Very interesting and explains well the anatomy of the hand and why we get the claw. Funny the same thing doesn’t happen with my toes. Or maybe it does, I just don’t notice. Anyway, it’s a good sign that it’s nearly time to get out. Interesting piece which will be open for discussion at Tooting Bec Lido tomorrow. I suffer as the water temperature goes down, but realise that it stopped around 5C. Now I can’t feel my hands at all, but still seem to have good control of them. As the Ape suggests, if you can touch your thumb and middle finger together then you are still fine to swim.